The University of Florence and the European Biodiesel Board, together with a number of major stakeholders in the EU algae sector, announced the launch of the European Algae Biomass Association. 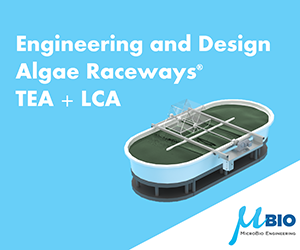 A global challenge to design visionary algae food, energy systems, landscape designs, and production systems was launched with the objective to create an open source “collaboratory” that expands and shares a vision for algae in our future. OriginOil, of Los Angeles, CA, adjusts its business model to focus on embedding the ‘midstream’ of algae harvesting and extraction technology into industrial algae systems. HR BioPetroleum, Inc. (HRBP), a Hawaii-based and -founded renewable biofuels company, announced that it will acquire Shell’s shareholding in Cellana, a joint venture between Shell and HRBP, including its six-acre demonstration facility in Kona, Hawaii. In April it would change its name to Cellana, Inc., and promote Martin Sabarsky to president and CEO. 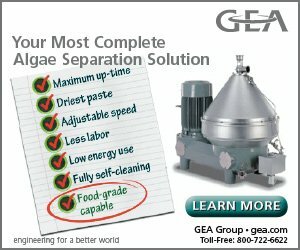 BioProcess Algae LLC began operating commercial-scale algae bioreactors at Green Plains Renewable Energy Inc.’s 65 MMgy ethanol plant in Shenandoah, Iowa. Solazyme began a collaboration with Australia-based Qantas airlines to pursue the potential for commercial production of Solazyme’s microbial derived aviation fuel, Solajet™, in Australia. Algenol acquired Cyano Biofuels GmbH, of Berlin, Germany, getting extensive experience in producing hybrid algae to make ethanol and green chemicals, and increasing Algenol’s research and development capacity. 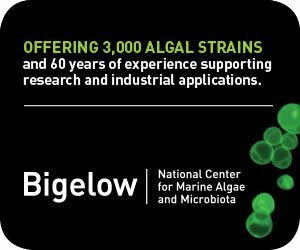 Viral Genetics Energy announced that it has been able to translate a research discovery related to cancer treatment into a potential breakthrough for biofuels made from algae. According to the company, laboratory experiments show that molecules which can disrupt the burning of fats (lipids) in tumor cells can also encourage microscopic plant cells like algae to accumulate and even secrete fats. In a move to set the stage for Sapphire Energy’s commercial scale development, as well as to facilitate their mass agriculture deployment, the San Diego-based “Green Crude” company entered into a multi-year collaboration with Ag giant Monsanto. Solazyme announced a joint development agreement and a letter of intent with The Dow Chemical Company to advance the development of Solazyme’s algal oils for use in next generation, bio-based dielectric insulating fluids used in transformers and other electrical applications. On the heels of Solazyme’s announced $100 million IPO came word of a major agreement with leading beauty retailer Sephora® and global multimedia retailer QVC® to launch Algenist™, Solazyme’s microalgae-based prestige anti-aging skincare line, in the U.S. and internationally. 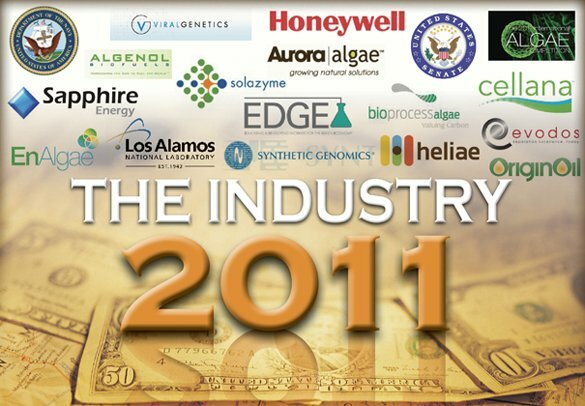 As part of the Obama Administration’s Startup America Initiative, U.S. Energy Secretary Chu announced the “America’s Next Top Energy Innovator” challenge, to give start-up companies the opportunity to license technologies developed by the national laboratories for $1,000 for their businesses. Aurora Algae officially opened its 20-acre demonstration facility with six one-acre production ponds in Karratha, Western Australia and announced they were producing more than 15 tons per month of algal biomass. Solazyme, Inc. announced a two-year joint development agreement with Bunge Limited to develop microbe-derived oils utilizing Brazilian sugar cane feedstock. The agreement builds on Bunge’s earlier equity investment in Solazyme that contemplates a manufacturing joint venture for the production of tailored oils at Bunge’s sugar cane mills in Brazil. The German-based technology company, The Linde Group, and green crude developers, Sapphire Energy, Inc., announced a multi-year agreement to co-develop a low-cost system to deliver carbon dioxide to commercial-scale, open-pond, algae-to-fuel cultivation systems. Around 100 students are expected to enroll this year in San Diego’s new EDGE (Educating and Developing Workers for the Green Economy) post-graduate training program to build a ready workforce ahead of an anticipated boom in algal biotechnology development. United States Senators Joe Manchin (D-W.Va.) and John Barrasso (R-Wyo.) introduced what they call “common sense” legislation to ease the pain at the pump and decrease our nation’s dependence on foreign oil. The Pacific Northwest has the diverse feedstocks, fuel-delivery infrastructure and political will needed to create a viable biofuels industry capable of reducing greenhouse gases and meeting the future fuel demands of the aviation industry. Senators James Inhofe (R-OK), Olympia Snowe (R-ME), and Congressmen Brian Bilbray (R-CA), Dan Boren (D-OK), Darrell Issa (R-CA), and Jim Moran (D-VA) introduced bipartisan, bicameral legislation, which allows for a more sensible implementation of corn-ethanol policy while encouraging greater competition in the pursuit of advanced biofuels. Solazyme’s long awaited debut on the NASDAQ May 27 proved worth the wait for the South San Francisco-based heterotrophic algae pioneers. After pricing shares to open at $18, trading on the first day drove the share price up to $21.01 by the end of trading, up nearly 17% on the day on a volume of 7,655,713 shares traded.